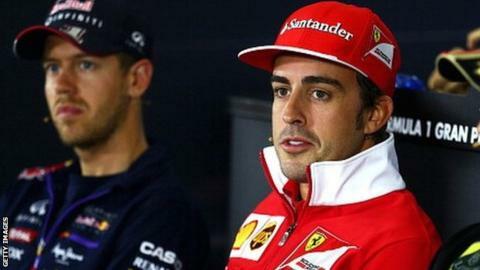 Fernando Alonso says it has been "a surprise" to see Red Bull's Sebastian Vettel beaten by team-mate Daniel Ricciardo in the last two races. Vettel was ordered to let Ricciardo past in Bahrain and China. He has also out-qualified Vettel three times. "He's not probably impressed people like he did in the past," twice champion Alonso said of German Vettel. "This year in four races, three times Ricciardo was quicker, a surprise for everyone and also for him, I guess." Alonso has been Vettel's biggest rival for the last four seasons, finishing second to him three times, twice by agonisingly close margins, despite driving an inferior car. At the end of last season, the Spaniard said in a BBC Sport interview that Vettel, world champion for the last four years, would only be able to demonstrate his true abilities when he drove a car that was not the best. In the interview, at the penultimate race, Alonso said: "When he will have a car like the others, if he wins, he will have a great recognition and be one of the legends in F1. "When one day he has a car like the others and he is fourth, fifth, seventh, these four titles will be bad news for him because people will take these four titles even in a worse manner than they are doing now." Asked how he felt about those remarks in the context of the start of this season, Alonso told BBC Sport that Vettel would still be a threat once Red Bull and engine partner Renault had addressed a few issues. "When Red Bull put things in place and Renault put some extra power to close the deficit they have on straight-line speed, I'm sure Sebastian will be on top of the form again and will be a favourite," he said. "But at the moment it has been a surprise these four races." Ricciardo played down the significance of his early-season superiority. "Whether he's had the best car or not, to be four-time champ you're special, full stop," the Australian said. Asked if he had shocked himself with his form this season, he said: "I don't know how much of it is a surprise. I obviously had a lot of belief and confidence in myself, otherwise it's hard to get to this level. "But it's still very early. Things have been going well and I feel happy about that. I feel good behind the wheel." Under new rules, one of Red Bull's key advantages has been annulled. So-called exhaust-blown diffusers, which used exhaust gases to boost rear downforce, were central to their success. Red Bull exploited the technology better than their rivals and Vettel could drive the car with it more effectively than then team-mate Mark Webber, who retired from F1 at the end of last season. "The feeling in the car is not yet where we want it to be and you see that in the results," said Vettel.